Originally Cultural Workers and Folk Artists Day was celebrated on March 23, but in December 2011, President Viktor Yanukovych moved the date to the third Sunday in May. And again it was moved in 2013 to November 9. It is an observance and not a public holiday. The holiday focuses on the importance on celebrating the invaluable input of cultural workers and folk artists to the revival of Ukrainian national culture and the development of folk art. It honors the country's rich cultural heritage. Cultural Workers and Folk Artists Day is typically marked with various educational and cultural events and activities, including (but not limited to) concerts, fairs, exhibitions, conferences, discussions. Many museums and art galleries hold special exhibitions dedicated to folk art. 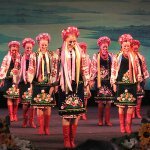 Ukrainian culture is truly unique because in has been influenced by both Western and Eastern cultures throughout the country's history. While Western Ukraine was part of the Polish-Lithuanian state, Eastern Ukraine was ruled the Russian Empire. After the reunification of the country, Ukrainian culture assumed its modern shape.